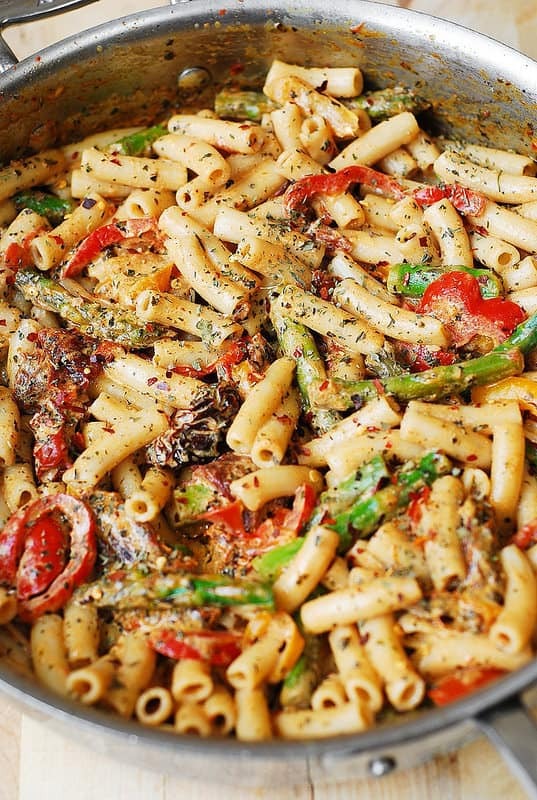 Vegetable Pasta with Bell Peppers and Asparagus in a Creamy Sun-Dried Tomato Sauce, with basil and crushed red pepper. 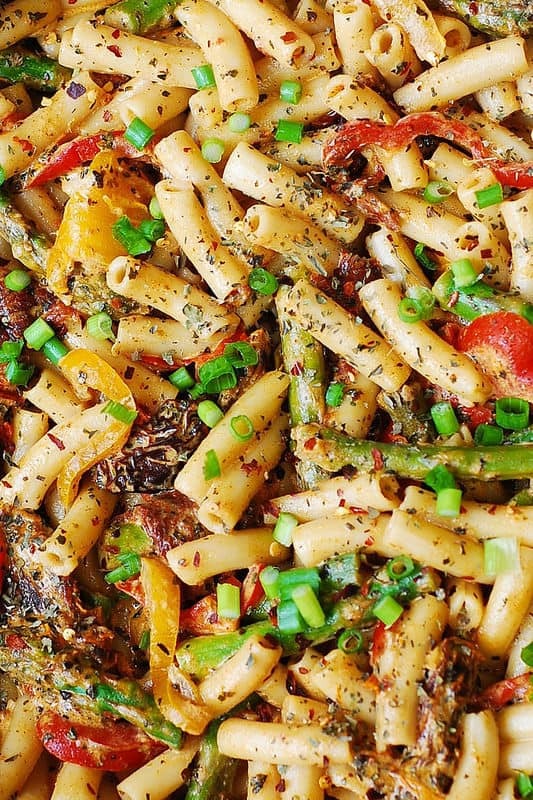 Meatless pasta that will make you fall in love with veggies! This Italian-style vegetable pasta is easy to make, full of flavor and just pure comfort food. Perfect for busy weeknights. What I personally love about this dish is that it’s a great way to use asparagus differently than just as a good old side dish. 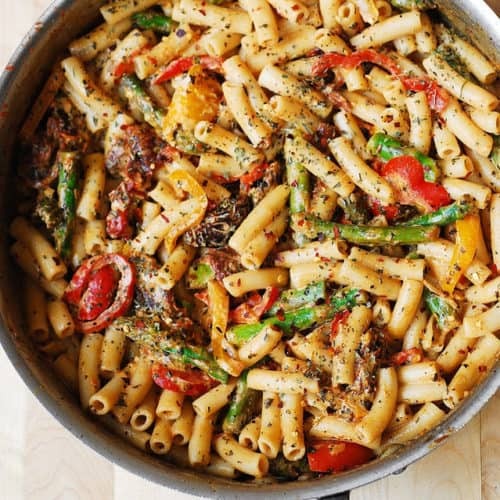 In this recipe, asparagus and bell peppers are seared in the skillet and then mixed in with the creamy sauce, spices, and pasta. 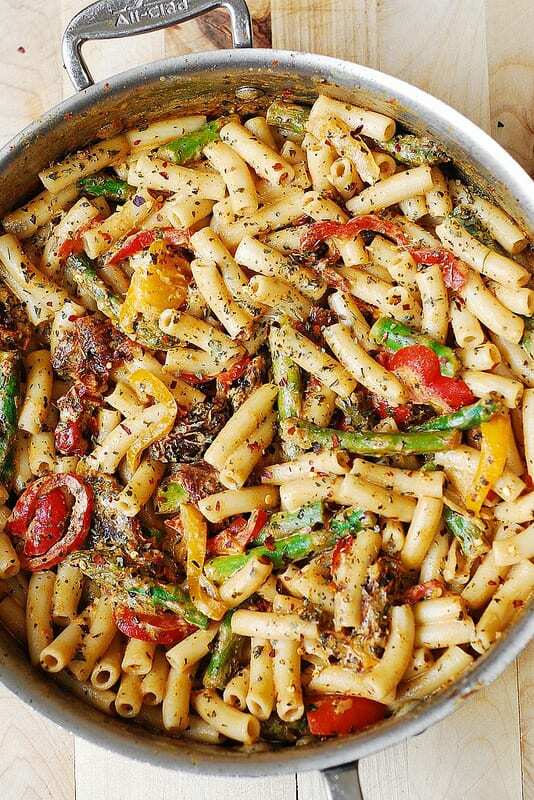 The vegetables taste so good with all the spices, pasta, and the flavorful creamy sauce in this dish! This meatless pasta is a winner! To make the creamy sauce, I usually buy a block of Parmesan cheese and then shred it myself at home. You can also use store-bought pre-shredded Parmesan cheese or shredded Mozzarella cheese. You can easily make this vegetable pasta gluten free. Use brown rice gluten free penne pasta to replace the regular pasta. Add a little bit more of crushed red pepper flakes, if you like, after you taste the cream sauce. This recipe only wins if you add an extra kick! Season with enough salt. There is nothing worse than bland veggie pasta. Salt does help bring all the flavors together. If you use sun-dried tomatoes in oil (in a jar), make sure to drain the sun-dried tomatoes from oil. Also, do reserve 2 tablespoons of this drained oil from sun-dried tomatoes for sautéing the vegetables. Reserve some cooked pasta water. You will use it to dilute the cream sauce if it gets too thick. If using gluten free pasta, rinse it with cold water after cooking – this will prevent it from getting mushy. Add half and half to the skillet with vegetables and bring to a gentle boil. Then, add shredded Parmesan cheese, mix it with half and half as it is boiling for only 30 seconds until it melts, then reduce heat immediately. Simmer and cook, constantly stirring, until all cheese melts and creamy sauce forms. If the sauce is too thick - don't worry - you'll be adding some cooked pasta water soon. Add 1 tablespoon of basil, and at least 1/4 teaspoon of red pepper flakes. Stir to combine. I left out the peppers and half the grated cheese, I just used what I had…delicious!!! I’m using vegan Parmesan for a nice vegan dish! What does half and half mean? Half Of what? Half and half is a mixture of heavy cream and milk, you can buy it in the milk section of any store. To make 1 cup of half and half, combine 1/2 cup of milk with 1/2 cup of heavy cream. Half and half is the US milk product that combines half milk half cream. To make 1 cup of half and half combine 1/2 cup of milk with 1/2 cup of heavy cream. Used fresh grated Parmesan. Cheese. . Not good…..cheese clumped. I also doubled the recipe for the sauce and glad I did. I also used a 10 oz box of pasta. The flavor and taste was amazing. Next time I’ll use the grated shaker jar of Parmesan . Great recipe! Thank you, Diane, I am glad you liked it!